Note: Always Dreaming had 2 second place finishes as a 2-year-old at Belmont Park and Saratoga. 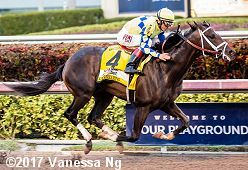 He made his 2017 debut winning a maiden race at Tampa Bay Downs then won an allowance at Gulfstream Park. He made his final prep winning the Florida Derby (G1). Sent off as the 9-2 favorite he won the Kentucky Derby (G1) by 2 3/4 lengths. Bet down to 6-5 favorite in the Preakness Stakes (G1), he led for the first 7f but succumbed to the pace pressure and faded to finish 8th beaten 14 lengths for his worst career result. He will skip the Belmont and be freshened for a summer campaign including the Travers.